As TDM based Central Office switches are being replaced by SIP/VoIP based Soft-switches, existing Value Added Services must also transition to the VoIP network. XOP Networks’ SIP based Universal Service Node (USN) facilitates just that. XOP Networks, Inc., a manufacturer of Value Added Service (VAS) platforms and Audio Conference Bridges announced availability of its SIP based multi-application platform that supports Voicemail with Find-me, Audio Conferencing, Enhanced Firebar, Switch Announcements, ANA and CNA, Mass Notification, Web Conferencing and Video Conferencing applications. XOP is continually evolving its Value Added Service platform as the communications network evolves. Phone companies in general and Independent Operating Companies (IOC) in particular are migrating their telephony network from legacy TDM architecture to next generation SIP/VoIP based packet architecture. As TDM based central office switches are being replaced by SIP/VoIP based Soft-switches, existing value added services must be maintained and enhanced to keep customer satisfaction at a high level. That’s where XOP Networks’ SIP based Value Added Service platform - the Universal Service Node (USN) comes in. The XOP Networks’ USN has proven compatibility with all of the major IOC switch vendors including Genband/Nortel, Metaswitch, Taqua, Ericsson and Huawei. “We are very excited to introduce SIP based Universal Service Node platform. Several of our IOC customers deploy separate platforms for each application. With our multi-application USN platform they will be able to deploy multiple applications on one platform, significantly reducing their CapEx and OpEx.,” said Sudhir Gupta, XOP Networks’ CEO. “Uniqueness of USN’s architecture allows us to expand number of VoIP ports and enable additional VAS applications – all through a remote software upgrade, a feat unheard of in the legacy TDM networks,” added Doug Jacobs, XOP Networks’ VP of Marketing and Sales. Beginning in 2003, XOP Networks embarked on developing a next generation IP based service and application platform. Realizing this vision, we shipped our first product, a Digital Collaboration Bridge (DCB) in 2004. A DCB combines rich Audio Conferencing with Desktop sharing, Document sharing and White boarding, thus creating a collaborative experience for the end users. Leveraging the success of the DCB, the product portfolio was expanded in 2005 to include the Group Alerting and Conferencing Server (GACS). The GACS allows mass notification messages to be dispatched over a variety of communications networks, while it brings an organization's brain trust into a quick audio conference. Year 2006 saw the addition of the enhanced Voice Mail Server (VMS) to the product line. 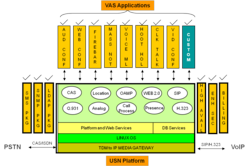 In 2007 XOP Networks launched its Universal Service Node (USN) which offers multiple value added services on one platform. In 2008, we added support for Hoot and Holler conferencing over TDM and VoIP networks on our USN platform. In 2009 we introduced Ring down Firebar Conference (RFCS) that allows a conference to be set up simply by lifting a handset on an analog or IP phone. Several other enhancements were introduced including support for Secure conferencing, SMS driven instant-conferencing, Group SMS and Voice SMS, and One Number Service capabilities. In 2010 the product line was further hardened for use in defense networks and received the coveted JITC certification from the US Department of Defense. Headquartered in Dallas, Texas, XOP Networks was founded in 2002 and is backed by a seasoned management team. Deployed at multiple Fortune 100 companies, CLEC/IOC customers, Government organizations, DoD networks (Air Force, Army and Navy) XOP Networks' products allow customers to improve employee productivity, increase business efficiency and enhance emergency communications. Having both legacy and VoIP interfaces, XOP products allow customers to seamlessly transition their value added services from legacy circuit switched networks to VoIP based packet switched networks.